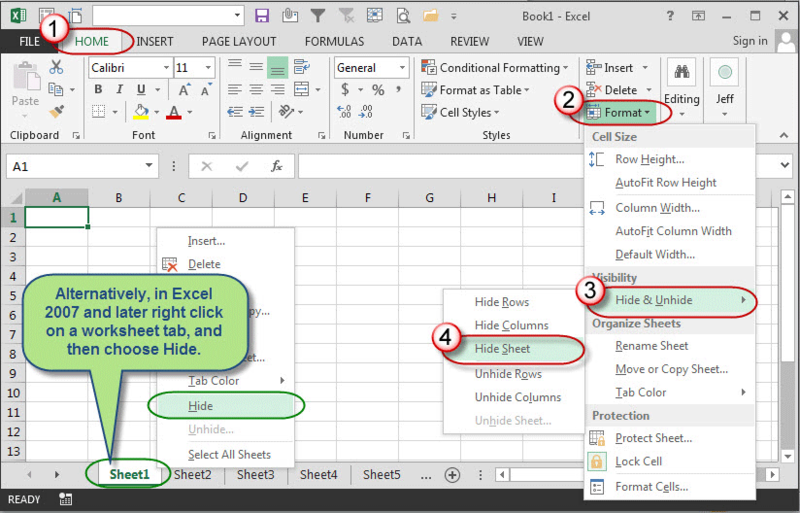 Hide and Unhide Multiple Excel Worksheets with Ease » Accounting Advisors, Inc. It's easy to hide worksheets in Excel, but unhiding multiple worksheets within a given workbook can be a tedious exercise. Users who don't know otherwise are relegated to unhiding worksheets one at a time. In this article I'll explain a technique that allows you to hide and unhide multiple worksheets at once. Excel 2007 and later: As shown in Figure 1, on the Home tab choose Format, Hide and Unhide, and then Hide Sheet. Or, to save a couple of steps, right-click on the worksheet tab and then choose Hide. Excel 2003 and earlier: Choose Format, Sheet, Hide. 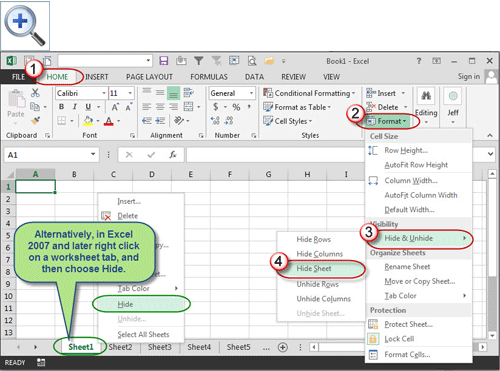 Excel 2011 (Mac): Ctrl-left-click on a worksheet tab and choose Hide from the shortcut menu. 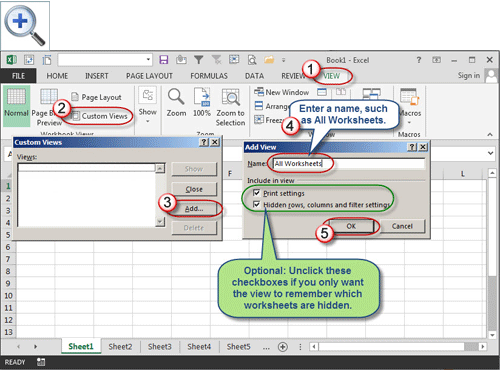 Figure 1: Right-clicking on a worksheet tab provides a faster means for hiding worksheets. Click on the first worksheet tab and then hold down the Shift key as you click on the last worksheet tab within the group that you wish to hide. Hide the sheets as discussed above. 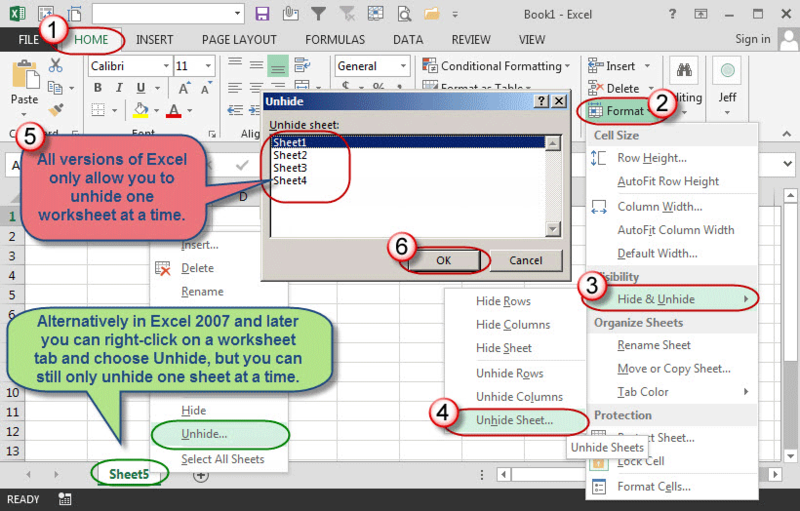 Excel 2007 and later: On the Home tab, you can choose Format, Hide and Unhide, Unhide Sheet, and then unhide a single sheet. You must repeat this action for each worksheet that you wish to unhide. You can save a couple of steps by right-clicking on a visible worksheet tab and choose Unhide. Excel 2003 and earlier: From any worksheet tab, choose Format, Sheet, and then Unhide. Select the sheet you wish to display and then click OK. Repeat as needed for each worksheet you wish to unhide. Excel 2011 (Mac): Ctrl-left-click on a worksheet tab and choose Unhide from the shortcut menu. Select the sheet you wish to display and then click OK. Repeat as needed for each worksheet you wish to unhide. 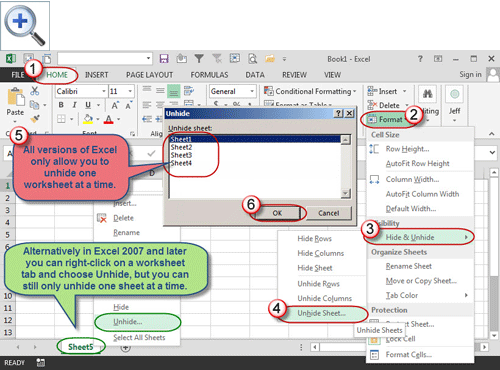 Figure 2: Excel's Unhide Sheet command only allows you to unhide one worksheet at a time. Choose Custom Views on the View tab or menu. 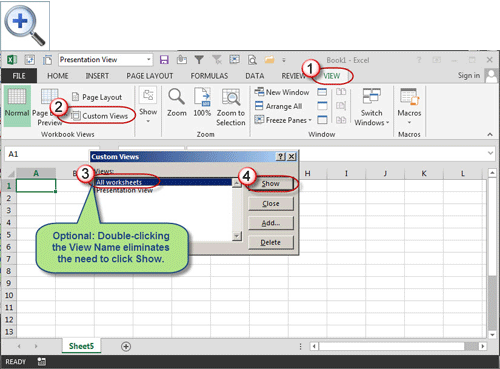 Click Add, and then type a name for your custom view, such as All Sheets, and then click OK.
Next, hide any worksheets as needed and then create a second view titled Presentation View, or a name of your choosing. Figure 3: Create a baseline view that shows all worksheets before you hide any worksheets. 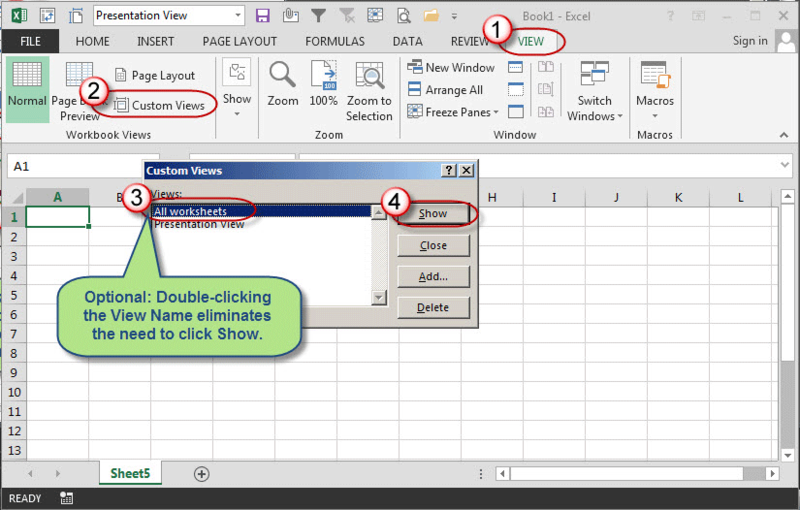 Going forward, you can toggle the view by selecting the Custom Views command and then double-clicking the view of your choice, or click once on the view and then click Show as indicated in Figure 4. This article only scratches the surface of what's possible with Custom Views. I'll explore this feature further in future articles. 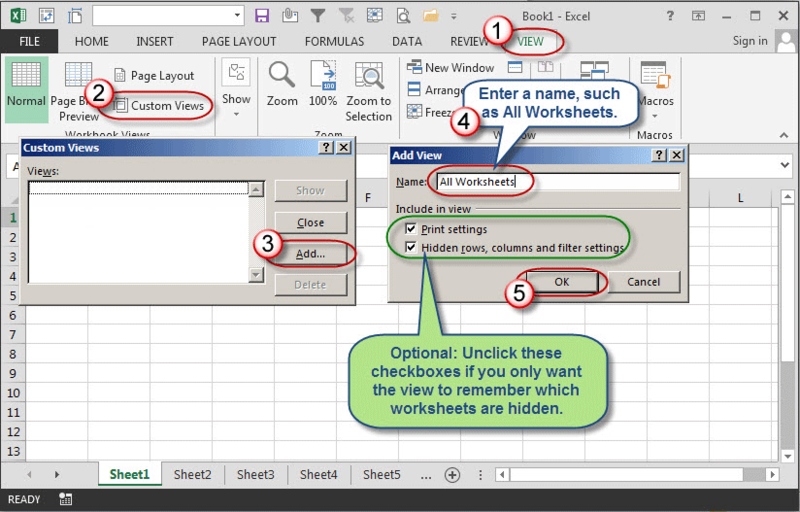 Figure 4: A custom view allows you to unhide multiple worksheets with just a couple of mouse clicks.